I am doing something different this Instagram Travel Thursday. The past 3 weeks I have been posting photos from our trip to Finland on Instagram, and instead of republishing all of the same photos here, I am posting some the same photos, but as non-cropped full images, and adding a few more pictures not seen on Instagram yet. 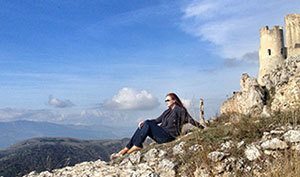 I admit, I have been dreaming of going to Greece for years, and this spring we spent numerous hours (days really), doing travel research for a dream island vacation in Greece. Then right somewhere between trying to figure out travel budgets, trying to book any hotels for a family of five (where we could actually stay in the same room so it would feel like an actual entire family vacation), and especially the fact I really missed my family in Finland, we decided to forget about the Greek islands for now, and headed to Turku archipelago in Finland instead. 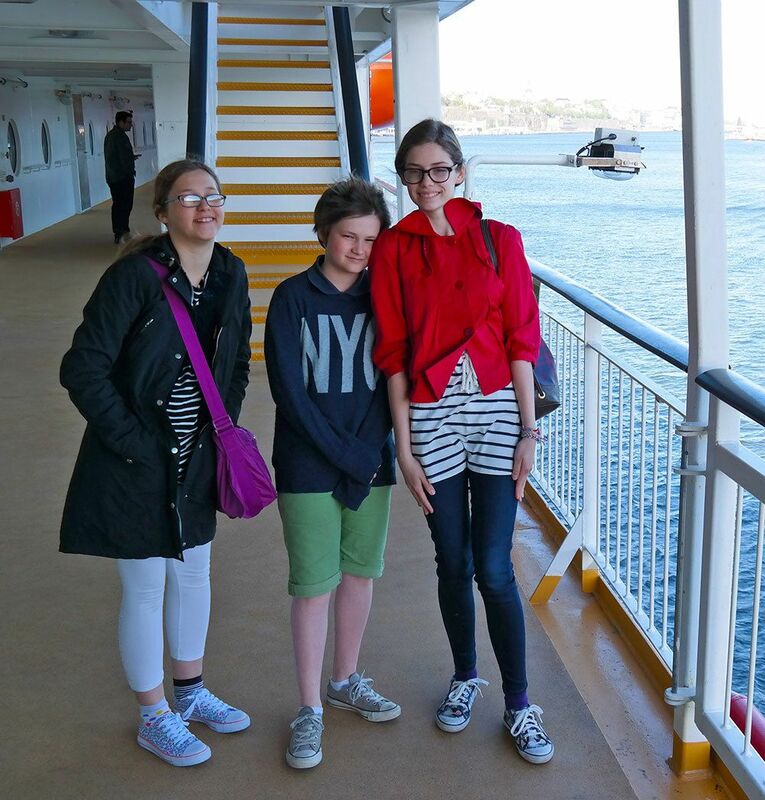 And of course, all of our three children have dual-citizenship and are both American and Finnish, so we had to take our little Finns to Finland – to the most special archipelago in the world. I wanted my family to see more of the area where I grew up, and spend time with my family in Finland. When you talk about vacationing with Scandinavians, your vacation report usually starts with the digits. Not the number of the days you were gone, not the number how much your vacation cost, but the temperature degrees. It only makes sense that when spoken about a vacation in Finland, I mention the summer weather. Finnish summers are short, and I think the essential feeling of the entire Skimbaco lifestyle comes from a perfect summer day in Finland. You know there are not many warm days in a year, and you will do everything in your power that you will enjoy the sun in the summer time, and bank on the warmth and the vitamin D for the upcoming dark winter. Summer gives you urgency to enjoy life, and the midnight sun and nightless nights are a constant reminder of life to be lived fully. Even many of my Finnish friends who travel multiple times a year, they try to stay at home in Finland as much as they can during summer. 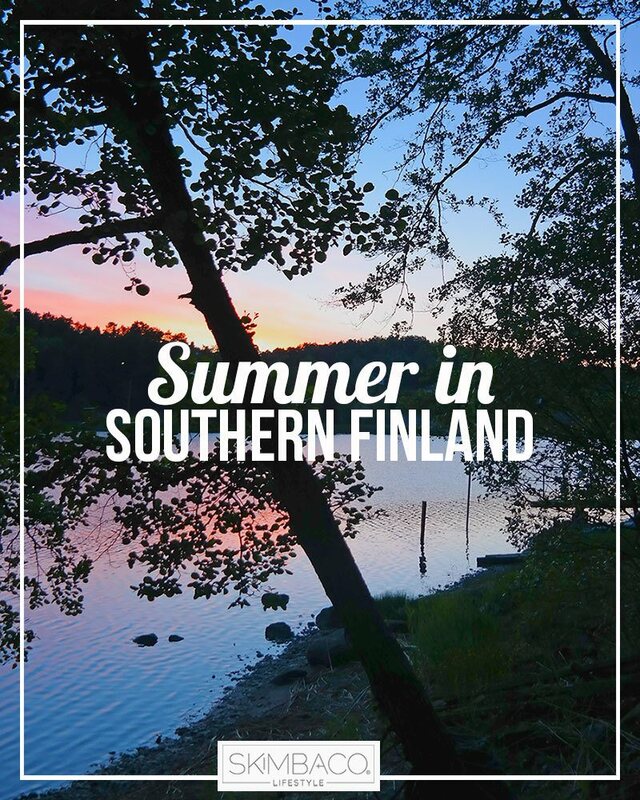 You can always catch some sun and warmth in Italy or Spain even outside the hottest summer months, but the Finnish summer is so short that if you travel for a week, you just might miss it. Or if you happen to be in Finland for the wrong week, you will also miss it. As happened with us. I am looking at the weather broadcasts in Finland this week – and it is around the perfect 27C/80F, warm enough to want to swim (even in Finland) but not too hot that you can’t tolerate to be outside. 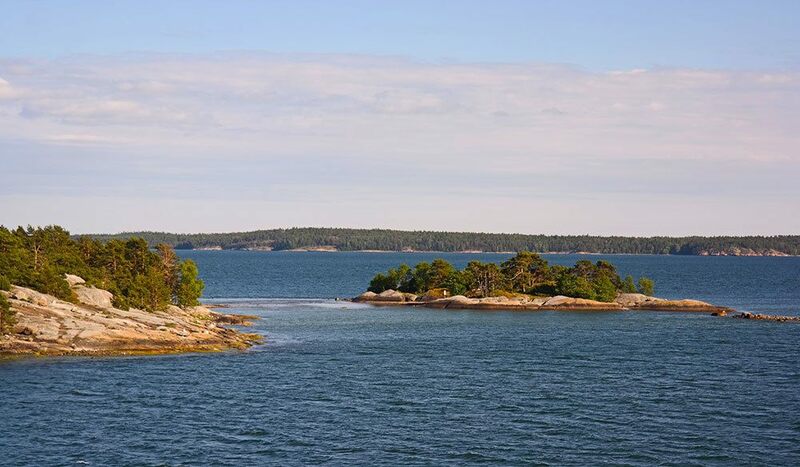 During our first week in Finland, when we were in the Turku archipelago at my parent’s summer house, the temperature was at the highest at 14C/57F, the entire week! In fact we witnessed something like a natural wonder, which has not happened in 30 years: snow during midsummer. (We didn’t see the snowfall, but saw snow on the side of the road while driving on the morning – most of it was already gone). It’s needless to say – we didn’t swim in the sea much. It didn’t stop my nieces and nephew from swimming though, and we watched in amazement as the kids enjoyed summer fun on the beach, regardless of the temperature digits. At least we went as far as put on our swimming suits, and took a dip in the water, but it wasn’t enough to earn even bragging rights. While the sun might not be as warm in Finland as in the other parts of Europe… the sun is up all day and all night long. There is about 2,5 hours in the between sunset and sunrise during the summer time and the few hours of night are dusk and dawn, filled with the most beautiful light you’ll ever see anywhere. The above photo has taken around midnight. My parents invited us to their summer house in the Turku Archipelago, only about 30-minute drive from the city center of Turku. It was the best kind of escape we could have asked for. We were by the sea, watching the boats sail by, no Wifi, and even the TV wasn’t turned on many times. Kids sat in the outdoor swing reading books, when they were not fishing with their grandfather, my dad, or picking up sticks with the cousins for the next fire we built by the shore. I admit, I didn’t take enough photos. My job requires so much photo taking, that when we were at the summer house, I didn’t even pull out my camera every day. I once forgot to check my phone for over 24 hours. I never opened my laptop during the entire two week trip. I unplugged in the best place in the world. Thankfully my husband (follow MattPresnal on Instagram) caught the picture of Gabriella catching a fish. And when I took kids rowing on an inflatable boat… one at the time. When I was a kid, the inflatable boat was on the back of my dad’s motorboat, but sadly now it’s the only boat left. 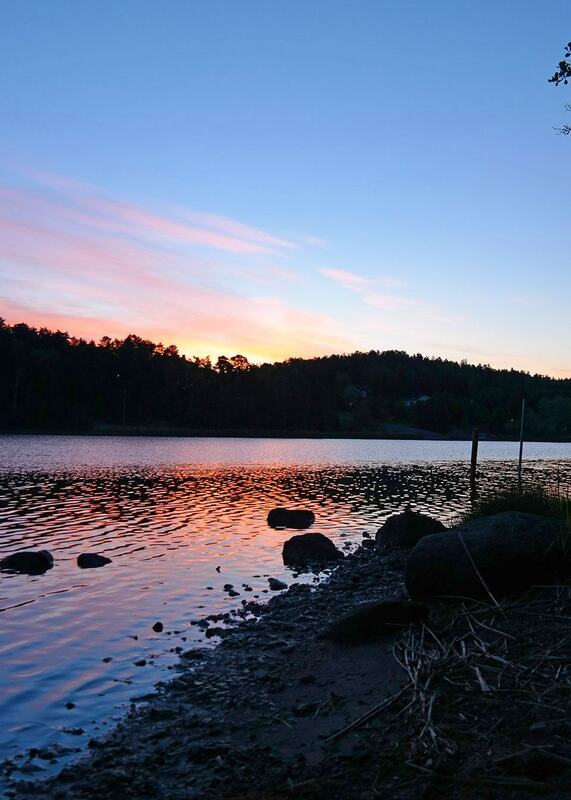 It was the perfect Finnish summer escape. 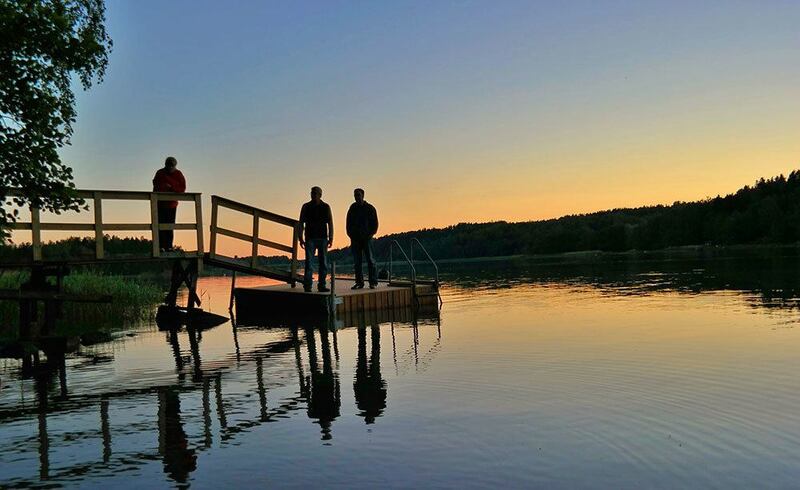 The kind of families in Finland do each weekend and if lucky one month each summer. We played cards, and warmed up the summer cottage sauna almost every night. We cooked on open fire (even though the house has a full kitchen and a propane grill). 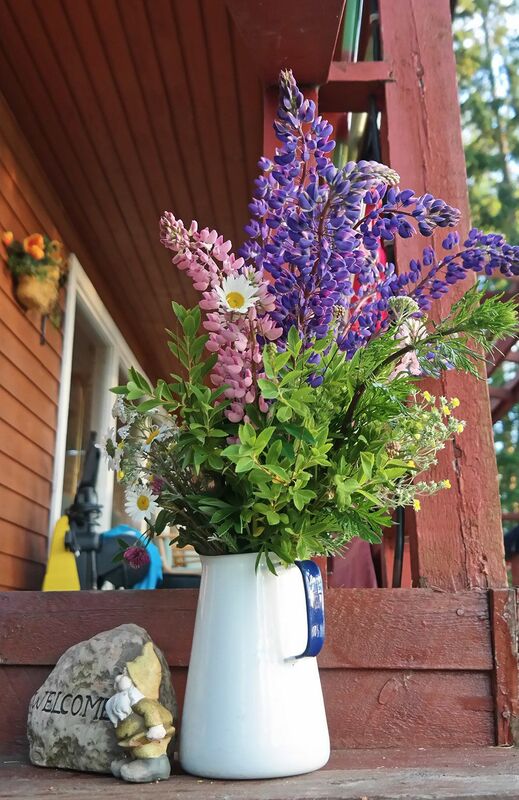 We picked flowers from the forest and put them in a pitcher to decorate the summer cottage. 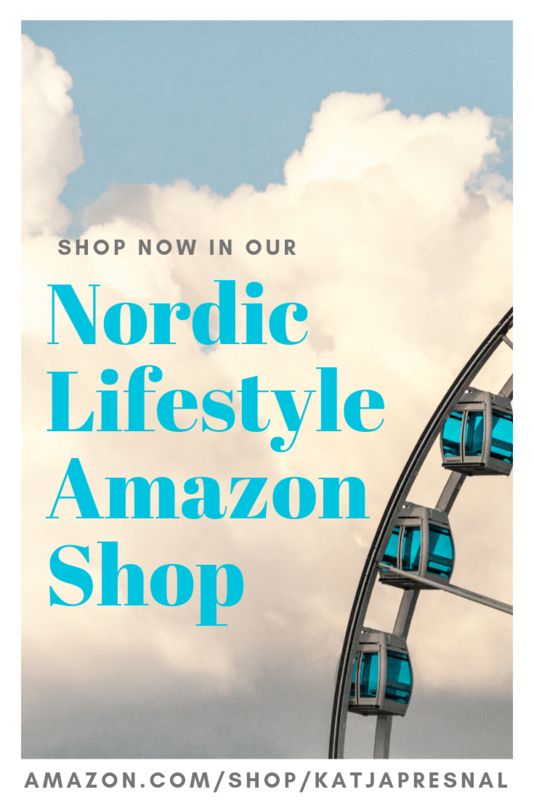 We spent time with my family, and I was trying to come in the terms that what Finland, and home are today, and how much many things had changed since I left 17 years ago – and yet how so many things had not changed. Above all this trip was for our family to be in touch of our Finn-side. 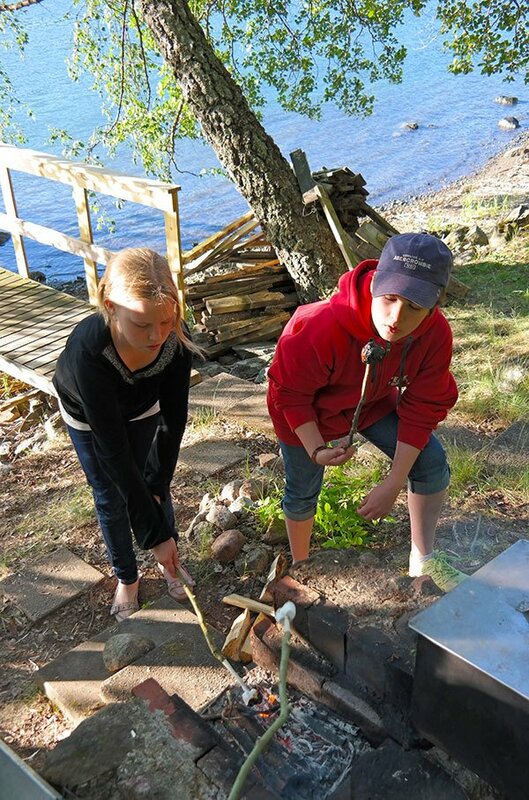 Although – everyone enjoyed how we did bring American traditions to the Finnish summer house – like how our kids taught their cousins how to make s’mores. I grew up in Paimio, about 25 minutes from Turku, in a large farming town, and we lived next to an apple orchid. I have warm childhood memories of being home with my family, and living next door to my grandmother, and playing in the woods, but I never quite felt home in Paimio, but I’ve always loved Turku and its archipelago, where we sailed every summer when I was a kid. 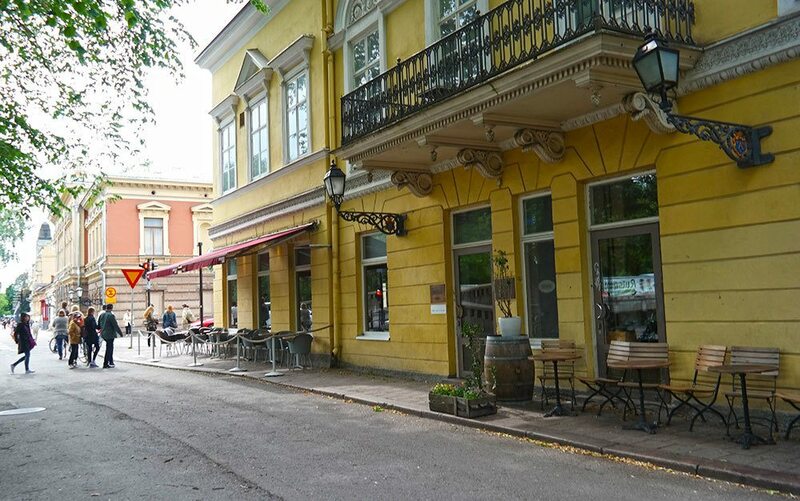 It was great to share more of Turku with my family, and we did small outings from the summer house. 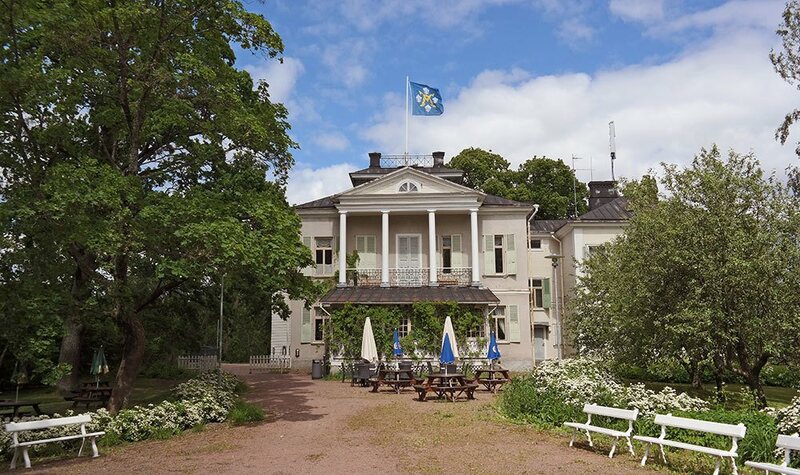 One day we toured Ruissalo island, a large recreational island just 10 minutes from downtown. The island has a picturesque camping ground, beaches, golf course, yacht club, botanical gardens and much more. The above house is a coffee shop and a B&B next to the camping grounds and the beach. 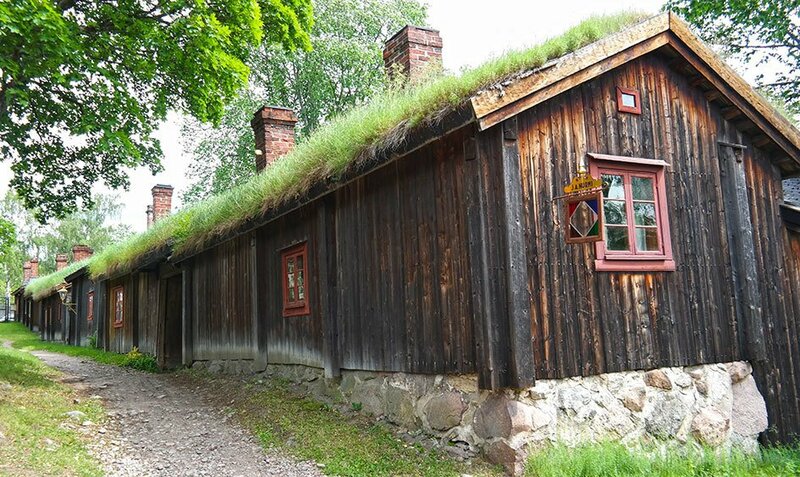 One of the most unique venues on island is the Honkapirtti, a restaurant and a cafe in a house built in traditional Karelia style. Karelia is an area where my grandparents are from, it was a part of South-Eastern Finland, but we lost it in a war for Russia. 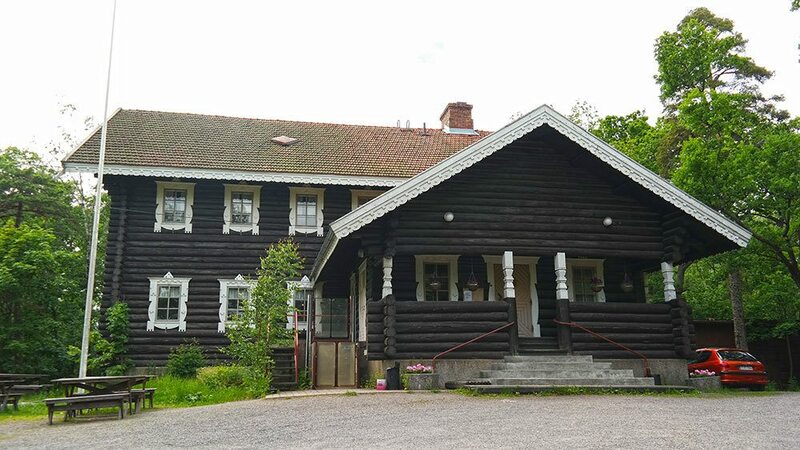 Knowing and living many of the Karelia traditions was still part of my childhood, and I wanted to take my family to the Karelia house, the Honkapirtti, in the honor of my late grandmother, whom my family unfortunately never got to know. In the traditional Finnish way we had peasoup and pancakes. 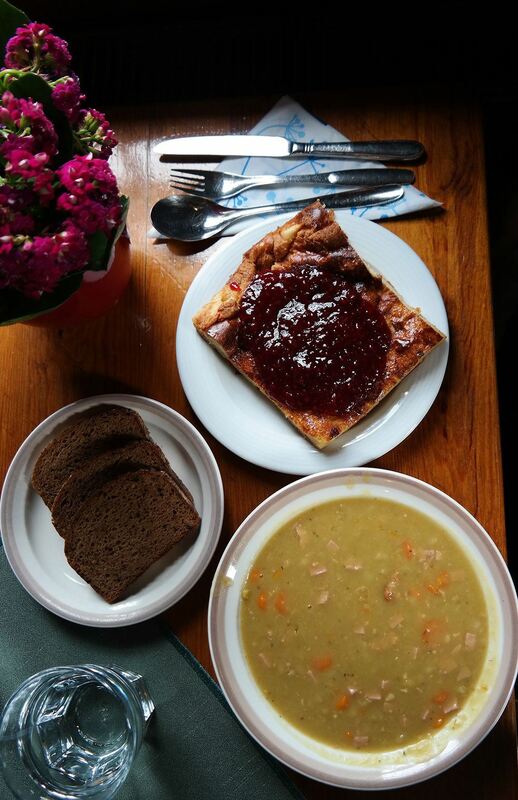 Finnish comfort food at its best. 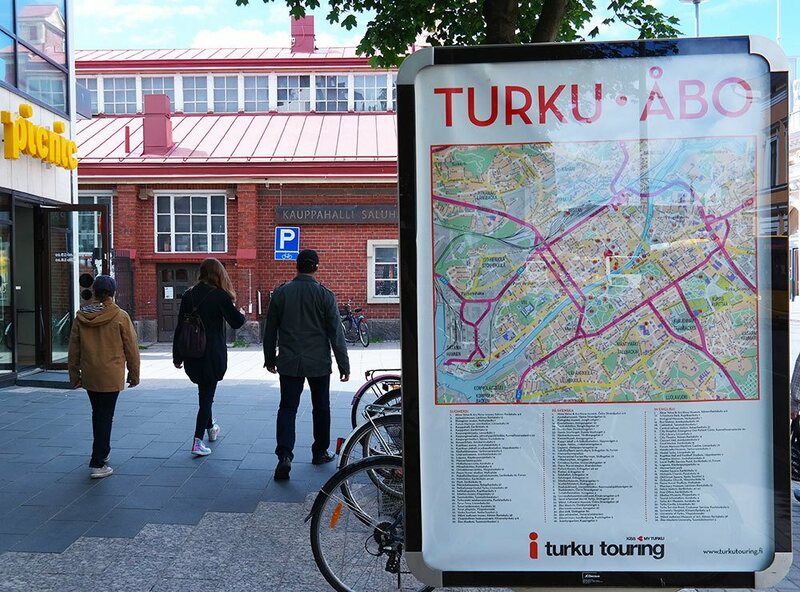 I tried telling as much about Turku and its history to my kids as they would listen, and we went to outdoor museums to learn more about the city’s past as an important port on the Baltic Sea. 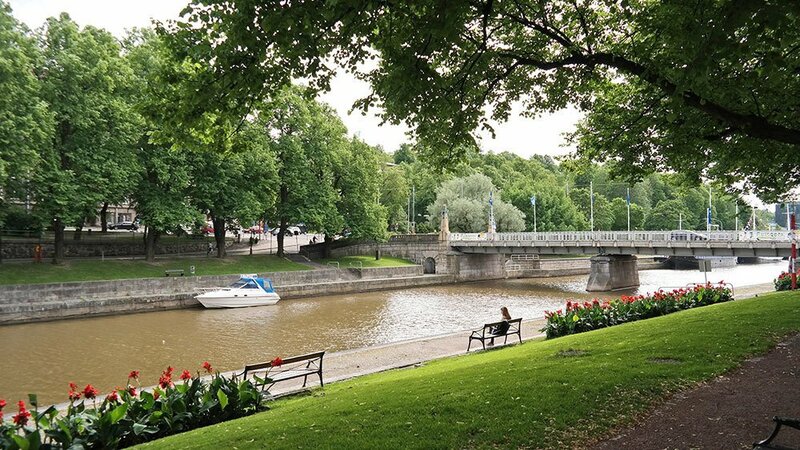 The best about the city of Turku is the Aura-river that splits the city in half. The river is full of river boat restaurants, and the biking and walking path right by it is loved by locals and tourists alike. There are several bridges on the river, and one ferry that keeps ferrying people from the other side of the river to this side of the river. 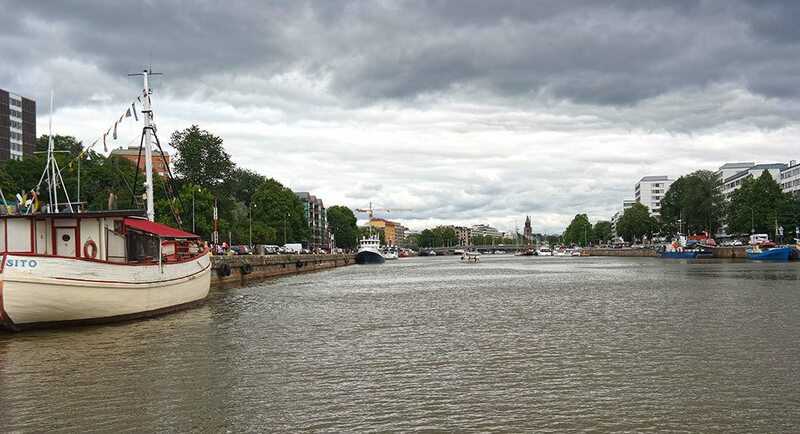 In Turku, you always know which side is “this side of the river” – even when technically you’d be on the “other” side. 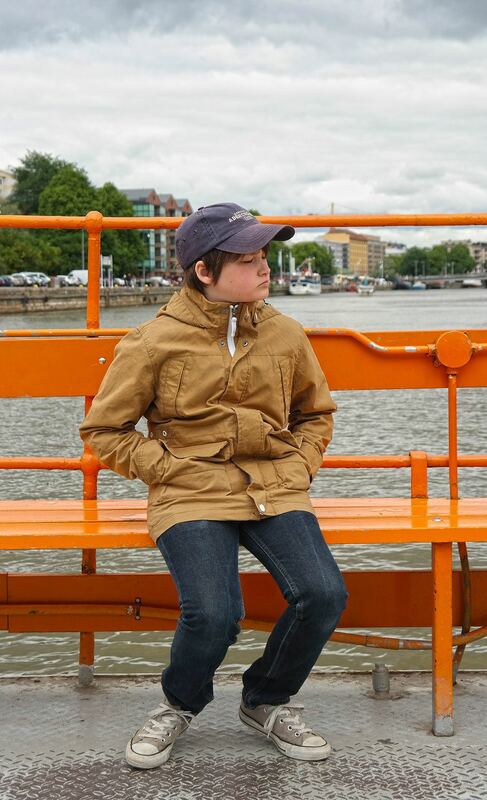 We took the ferry, called “Föri” to the other side of the river, and continued walking and watching the boats. 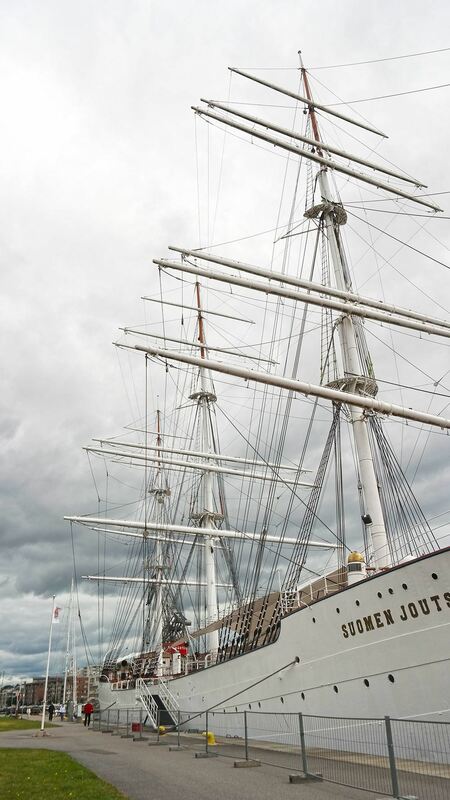 On the far end of the river is the maritime museum and the Suomen Joutsen ship, a famous landmark of Turku. Speaking of ferries and ships… My visit to Finland would not be complete without setting onboard at least one boat or ship. I would love if getting to Finland was easier than it is. Or let’s rephrase it: getting to Finland is easy, but time-consuming. It takes me almost as many hours to get from Linköping, Sweden, to my hometown Paimio in Southern Finland, as it takes me to fly from here to New York City. The reason: there is a 12-hour ferry ride in between Finland and Sweden. Good news is that the ferries offer entertainment, plenty of restaurants and the cherry on the top: tax free shopping. The ferries also make it very easy and inexpensive to extend your visit to Finland if you are visiting Stockholm. (Or the other way around.) You can take a two-night cruise from Stockholm to Helsinki, and spend a day visiting Helsinki on your trip to Stockholm. I highly recommend it, and a two-day cruise will cost you far less than two nights in a hotel in either city. 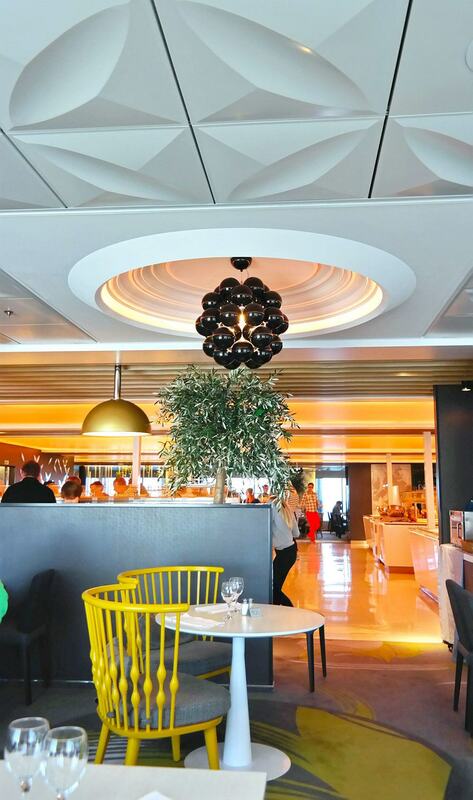 When traveling between Stockholm and Helsinki, I like the Silja Line’s Silja Symphony, the Instagram Travel Thursday trip was on that ferry last winter, and it has now gone through massive renovations. 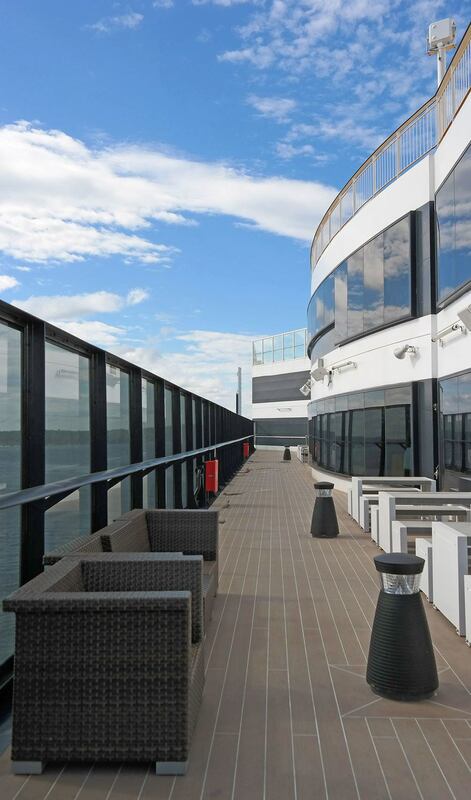 However, the newest ferry sailing between Sweden and Finland is the Viking Grace by Viking Line, and I wanted to see how the newest ship measures up, so we chose Viking Grace for our trip to Finland. 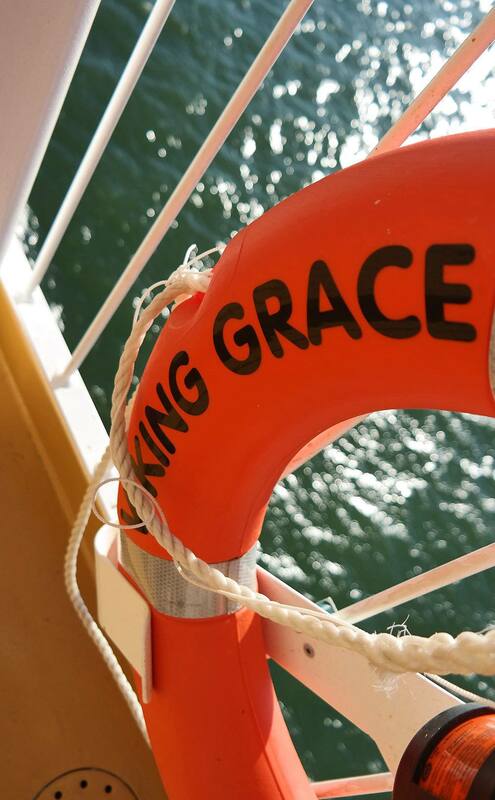 The Viking Grace goes between Stockholm and Turku, and I highly recommend it for the Stockholm-Turku route. I really liked the Viking Grace for the design and architecture. 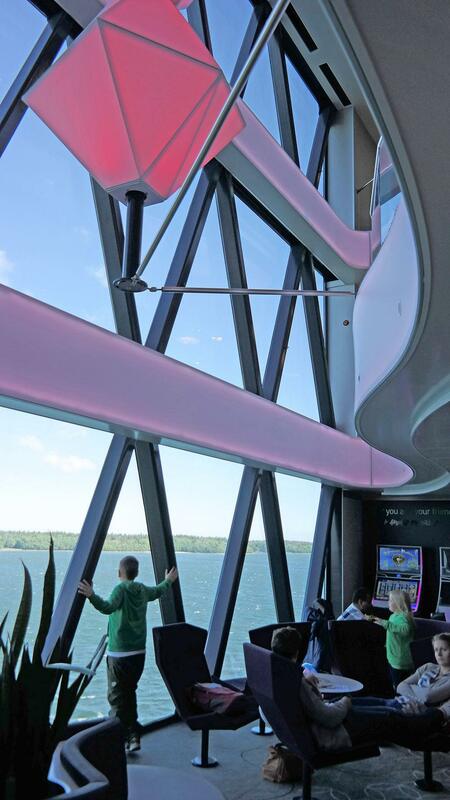 The ship is designed in a way that you can see outside as much as possible, so the beautiful archipelago or the sea is much more prominent than in many other cruise ships/ferries. 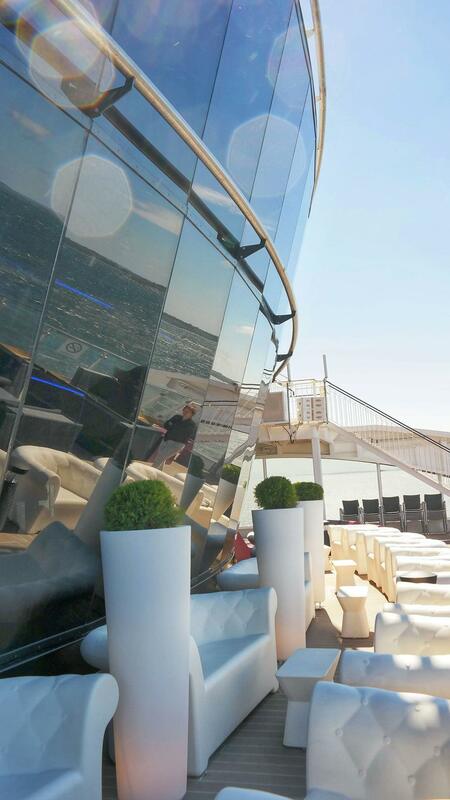 There were stylish and comfortable places to hang out both inside and outside on the decks to enjoy the gorgeous views. 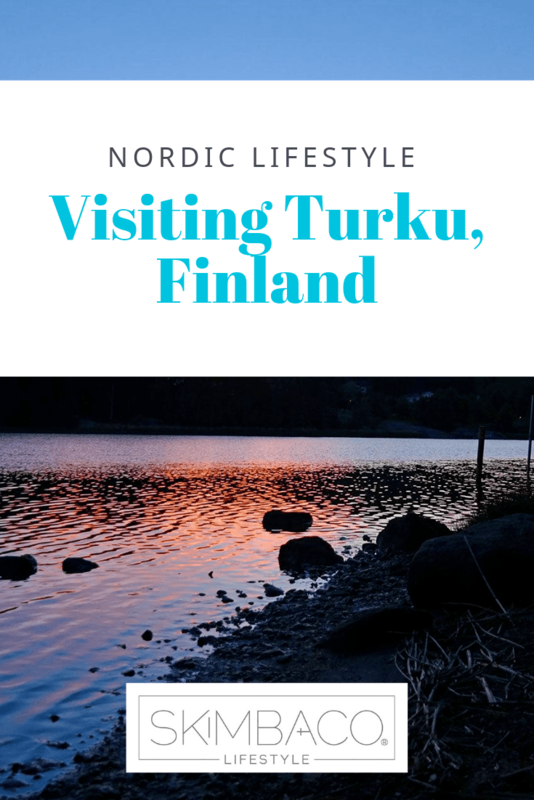 If you have been on luxury cruise ships, the ferried between Finland and Sweden do not measure up, but you can get a luxury experience. The Viking Grace has a spa with a snow cave, saunas and jacuzzis. 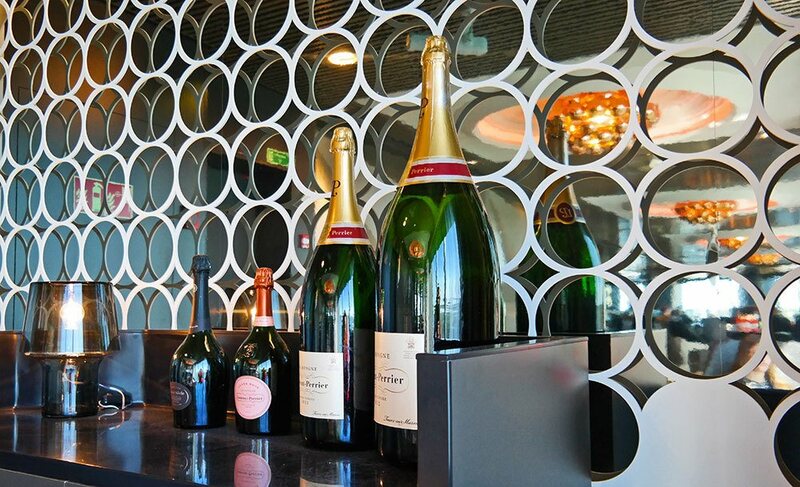 My favorite was the laid back champagne bar, I could have sat there for a few hours just sipping champagne and watching the sea views. 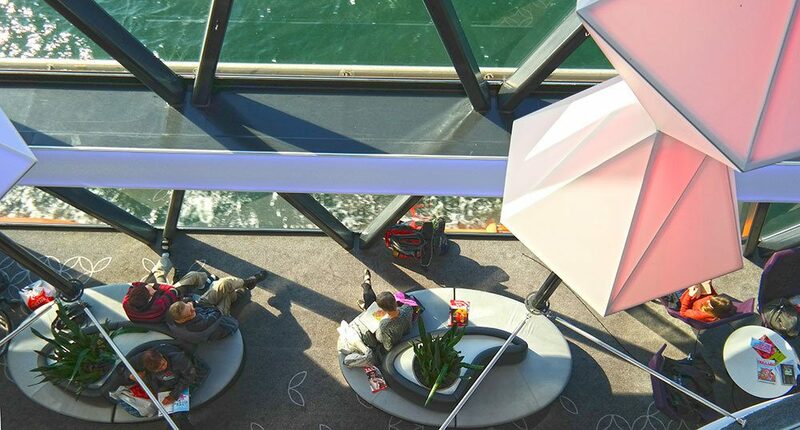 One of the most popular things on board the ferries is dining in the ever so popular buffet, and the trip is typically worth it just for the seafood part of the buffet. 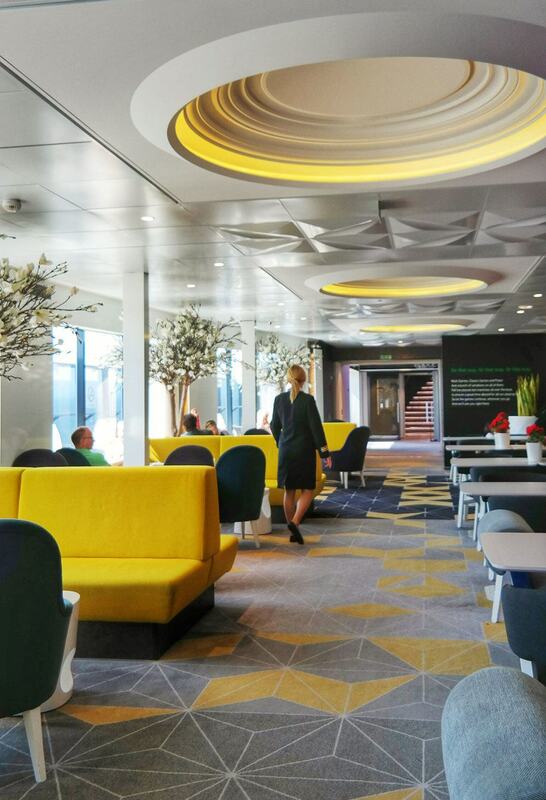 The dining options during the daytime on Viking Grace were pretty limited, and we did think the buffet was probably the best option, but the food selection was not nearly as good as what we had just experienced on the competing ferry line, at Silja Line, a few months before. More of my photos from Finland on Instagram. Follow me as Skimbaco for travel photos and KatjaPresnal for food and family photos. So beautiful! Luckily I am going soon to Finland too and get to (hopefully) experience some relaxation by the water, fishing and stuff. Love your photos, every single one of them! These are great photos, Katja. Beautiful photos and that whole experience is exactly what I imagine from a summer holiday in Finland (I’ve only been in winter. But one day …). The cruise to Sweden looks brilliant too.